"This is my absolute favorite dish! 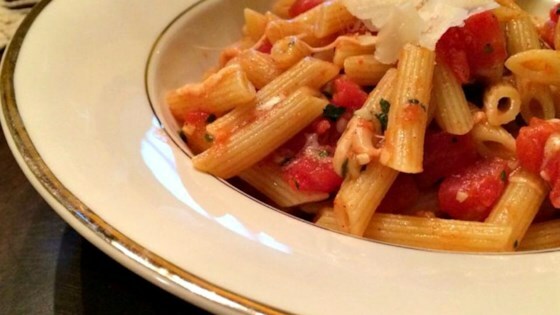 If you like food with just a little kick and you are a pasta fan...this recipe is for you!" This was a fantastically fresh alternative to ordinary pasta sauce. I added some extra veggies (zucchini, spinach and mushrooms) and it made a tasty primavera. Bravo! I added some fresh basil to this recipe, along with chicken and shrimp, and it was quite good. I think more tomatoes than recommended would be better next time. This is a very easy to make recipe that is great when you are short on time. The cajun spice mix you use is everything to the recipe, so choose wisely.